Schrock Innovations believes in giving back and investing in the community. That’s why we jumped at the opportunity to give to St. Teresa’s Parish Family for their parish bazaar to be held on November 10th this year. 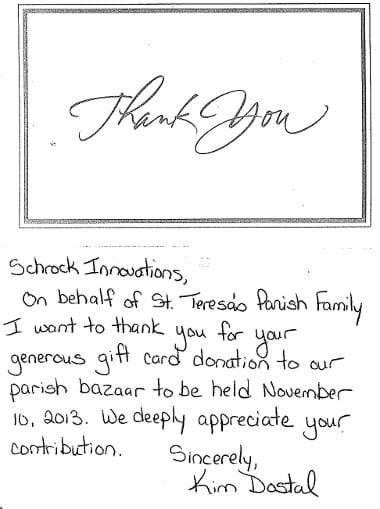 Schrock Innovations Supports Dreams Unlimited Schrock Donates to St. Terese’s Parish St. Teresa’s Parish Bazaar A small way Schrock Innovations can give back.